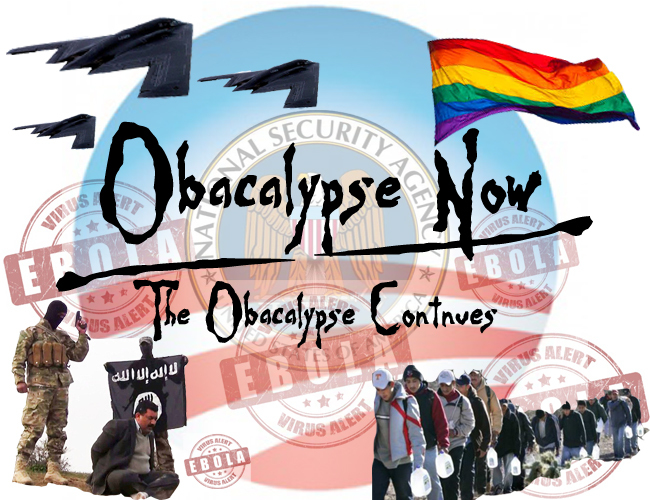 Last month, in Obacalypse Now: War, Famine, Pestilence, and Wicked Leadership in Romans 1 America, we covered things like ISIS, Ebola, the emerging Orwellian NSA State, our teetering Monopoly Money economy, and the aggressive homosexualization of the culture. You know, the basics of our culture’s hopey-changey vibe of the moment. In just the few weeks that have passed since that post, we’ve seen quite a lot in the way of accelerated decline. For one, Ebola has arrived. For two, “don’t worry, the ‘professionals’ are in complete control of the situation”. And for three, while we have only one confirmed Ebola carrier in the US at the moment, we also have 110 million STD carriers here in the proud and funky “land of the free” and home of the NSA. As in: Bad enough to break a very proud people of their self-referential ways and worldviews? Most conservatives seem to want another Reagan much, much more than they want the living King of kings. Oh sure, they like Jesus and Christianity in an ornamental, lucky rabbit’s foot kind of way, but in practice as the source of things like law, economics, education, and politics? Take your theocratic wackiness and go hang out with your Sharia pitching cousins in Syria! Basically, most professing Christians in America now openly treat submission to God in practice where matters of law, economics, and politics are concerned as the equivalent of submitting the same things to Allah. That is the level of their disdain for the King of kings. The controlled, contrived left/right paradigm has the masses of both major political ideologies marching in near total harmony towards the same Christ-less, Statist end…and they are too engrossed by their favorite political and pop-culture puppet shows to even notice. Most professing American Christians are still inclined to look everywhere but Scripture first (or at all) for their approach to law, economics, and politics. The State-centered American perspective that took root generations ago has blossomed and grown in great part through the cherished tradition of the State-controlled “education” of our children. This coupled with a similarly unbiblical and assumed secular approach to economics and business has paved the way for financial elites and corporations to mold pop-culture into an increasingly aggressive anti-Christian weapon. So it is that the economic attributes of the “mark of the beast” are on the rise all around us. And all of this is only even remotely possible through the willful and often enthusiastic support of professing Christians in America. If Christians rejected the Communist Manifesto inspired institution of State-controlled children’s education rather than supporting it, it would collapse almost instantaneously. If Christians began to move their wealth away from the elite and corporate owned systems that are designed to enslave the masses and advance secularism, great strides away from cultural darkness and toward the light would immediately become possible. But these things are only going to come on the other side of repentance. In the meantime, we’re just marching headlong toward man-centered oblivion. Let the Gospel and Great Commission be our pursuit even more so then in this dark and critical time. Lord willing and by His grace, restoration can and will come to even this rotting, proud, and rebellious culture. We have been placed here for a great purpose, Christians. The only hope that this culture has is Him. It is our mission to proclaim and apply that truth at every opportunity.